Darrel Yeargle runs Whitings Rubbish Removal, a waste hauler based in Littleton. He's been scrambling, he says, to replace the plastic lids on his dumpsters with bear-proof metal ones he makes by hand in his shop. New Hampshire wildlife officials have the same message every spring when it comes to bears. Bring in bird feeders, they say, get chickens inside some kind of bear-proof enclosure and make sure trash is stored away. But the New Hampshire Fish and Game Department has been running into a very human problem: apathy. Fish and Game responds to roughly the same number of bear-related calls each season. Timmins considers that a success story, given the bear population has risen over time. But what’s discouraging, he said, is the vast majority of calls are consistently rooted in the same human behaviors. People continue to leave garbage in the open, continue to feed the birds and leave chickens unprotected. 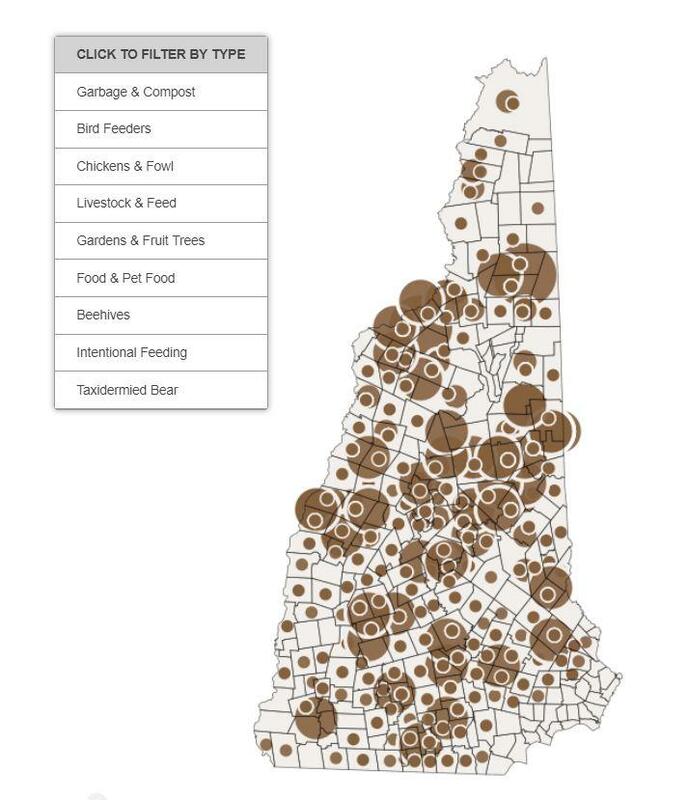 Click here to see a map of things that have attracted bears to human-occupied areas in New Hampshire. To Timmins, it’s a clear sign officials are hitting a wall in terms of getting their message out there, and getting people to care. The concern is bears learning to seek out human-related food and becoming comfortable around people. When this happens, the animals can become a persistent presence in neighborhoods, and ultimately find their way into homes. This is the kind of behavior that leads to bears getting shot. One solution is to put some stakes in the game for residents who don’t otherwise heed wildlife officials’ advice. At Timmins’ suggestion, Littleton is the latest of a handful of North Country communities – hot spots for bear activity – to follow this path. The town enacted an ordinance last year mandating trash be stored in bear-proof containers, and enacting fines for those who don’t comply. Unsecured garbage is the single biggest trigger for bear-related calls to Fish and Game. So far, residents and business owners have been largely receptive to the rules, said Milt Bratz, Littleton’s health officer. With a couple exceptions, those he’s approached with concerns – over a consistently overflowing dumpster, for example – have made improvements. But this year will be the real test, he said, the first full season with the ordinance in place. Littleton has a busy main street, particularly in the summer months. At a restaurant called Topic of the Town, waitress Mimi Negron said the only change she’s noticed around the new wildlife rules is the incredible effort it now takes to lift the now-bear-proof lid off their dumpster. “It’s so heavy,” she laughed. Talk of the Town’s waste hauler is Whitings Rubbish Removal, a local family-owned company run by Darrel Yeargle. Yeargle has been scrambling over the past year to make sure the trash containers he services are bear-proof, in line with the new regulations. “I’ve been just in a dead run,” he said. Click the link in the story to visit our interactive map to find out what's attracting New Hampshire's "nuisance bears." He’s doing this bear-proofing by hand, replacing plastic lids that come standard with custom, metal ones he makes in his shop. It’s expensive and time consuming, he said. He wants to support the town’s goals, but thinks a true regulatory solution to the state's bear challenges would look broader, including bird feeders and chicken coops. Plus, he said, there needs to be a regional solution, not just one-off ordinances town-by-town. Fish and Game is expecting this year to be particularly difficult. Bears are emerging from hibernation hungrier than usual because of a lack of wild food last season. Timmins would like to see New Hampshire consider state-level rules similar to those enacted in Littleton, but that’s a long way off, even in the best case scenario. In the meantime, he’s expecting bear calls to start pouring in as the season heats up in the coming months.